4 What is Behaviour Change? 4.1 Why is it important? Global obesity levels have been on the rise over the past 3 decades; this is true for both males and females for all age groups,. According to recent figures, the average age at which individuals in the UK are becoming obese is decreasing. Researchers found clear trends with time, highlighting not only is the prevalence of obesity increasing but it is also becoming more common at an earlier age . Obesity has more than doubled in children and quadrupled in adolescents in the past 30 years. Thirty one percent of boys and 28% of girls aged 2 to15 were classified as either overweight or obese in 2011. In 2012, more than a third of children and adolescents were overweight or obese. Latest figures for England show that a fifth of children joining primary school are now overweight/obese. Studies have shown adolescent obesity is directly associated with both maternal and paternal BMI and parental obesity is an independent risk factor for child/adolescent obesity. It has been reported that if one parent is obese, there is a 50% chance their child will be also and if both parents are obese the risk rises to 80%. The evidence shows an urgent need for change and intervention in obese adolescents. In order for any intervention to be successful, the individual needs to understand it is necessary to change their way of thinking towards obesity. This Physiopedia page recognises interventions have not been effective and there is a greater role for physiotherapists to play in the obesity epidemic. Therefore, the focus of this Physiopedia page is to enable physiotherapists to foster behavioural change in obese adolescents. This is a learning resource for physiotherapy students and practising physiotherapists to equip them with the knowledge and skills required to effectively encourage behaviour change in obese adolescents. Identify the associated biopsychosocial risk factors, health implications and psychosocial effects of adolescent obesity. Define behaviour change and list characteristics required of a physiotherapist to foster change. Be able to apply the trans-theoretical model to clinical practice in an obese adolescent population. Demonstrate awareness of the potential attitudes and perceptions surrounding adolescent obesity. Be able to clinically reason and justify the selection of appropriate behaviour change interventions. Therefore, adolescent obesity is not a subject that should be taken lightly, and the list above highlights the serious need for intervention in this population. As physiotherapists, it is important that we take into consideration the whole picture and are able to grasp the patient’s perspective when any patient presents to us in clinical practice. This is essential when planning specific interventions for patients . There are a variety of reasons why an adolescent may become overweight or obese. Psychosocial stressors which can result in emotional eating include bullying, experiencing neglect/maltreatment, or living in an environment where there is a lack of consistency, food-limiting or general adult supervision. When young people become stressed, they are more likely to overeat or comfort eat. Other examples of stressors can be parents divorcing/separating and physical or mental abuse, resulting in the adolescent turning to food as a coping mechanism. Chronic stress can lead to poor sleeping patterns, tiredness and a lack of motivation to participate in regular physical activity. This creates a vicious cycle as insufficient sleep is associated with the development of obesity. Overweight adolescents are often made fun of and bullied, making it challenging for them to make friends. There is a often a negative stigma attached to obesity, especially in the thin-obsessed culture we live in. Teasing and bullying, which make the adolescent feel uncomfortable, can make it hard for them to lose weight and can cause them to gain more weight as they may turn to food for comfort. Low self-esteem and a fear of being bullied can make adolescents less likely to exercis. It is often a combination of some of these things which can cause an adolescent to become obese, and it is vital that the physiotherapist takes these contributing factors into consideration when communicating with the patient. As briefly mentioned above, overweight and obese adolescents often endure harsh psychosocial consequences as a result of their weight. These include depression, bullying, social isolation, low self-esteem, negative body image and overall reduced quality of life. Sometimes it can be difficult to determine whether depression is the cause or result of the obesity. This is where communication with the patient can be vital in order to determine the relationship between their obesity and depression. It has been established that the longer the adolescent is overweight or fails to lose weight, the higher the risk of developing depression and other mental health disorders. Depression leaves adolescents and people of all ages feeling less motivated to participate in physical activity. A negative body image can affect both mood and eating patterns, and can be emotionally damaging for young people, particularly in the world we live in today. It is important for young people especially to grow through adolescence being comfortable in their own skin and with their own identity. Adolescents who find it difficult to manage their weight can experience periods of very low self-esteem. As physiotherapists, it is essential that we use appropriate language and continue to encourage and motivate this type of patient. All of the above can result in the adolescents experiencing reduced quality of life, and a reduced ability to cope and manage daily life. Again, low quality of life is associated with poor physical activity engagement and a reduced perception of themselves as a person as a whole, feeding the vicious cycle of obesity. The role of the physiotherapist is broadening as our population endures an obesity epidemic. Physiotherapists need to be well equipped to deliver patient centered care for adults, and more importantly, for an at risk adolescent population. It is understood that patients will not be referred to a physiotherapist to address their obesity, but more likely for a musculoskeletal issue. This finding was reflected by Nye et al (2014) who revealed there was an increased hazard ratio for musculoskeletal injury in those with high-risk abdominal circumference. Although it isn't a causitave factor, obesity does have a strong correlation with musculoskeletal injuries. This research is important because it informs physiotherapists that by addressing obesity we may also be treating a musculoskeletal issue in our patients. Under current treatment guidelines available to physiotherapists such as Chartered Society of Physiotherapists, National Institute for Health and Care Excellence (NICE), and Scottish Intercollegiate Guidelines Network (SIGN), the care given to patients who are obese is most often in the form of exercise prescription. While it is imperative that the patient changes the behaviours that are factors in their poor weight management, continuing to prescribe positive active lifestyles is critical to managing the patient's weight. The current guidelines reflect this sentiment and will be summarised below. The SIGN guidelines indicate that if behaviours are to be changed in children and adolescents, it needs to come from all aspects of their life. The guidelines target interventions to occur in schools, within families, and between children in their hobbies. They require schools to make choices for their students that will promote physical activity such as physical education and active activities during breaks at school. It also specifies that parents should take an active role in their child's obesity and time in sedentary behaviours (>2 hours per day) while promoting active behaviours (60 minutes per day) . The NICE Guidelines above take a more personal approach to weight loss in adolescents compared to the SIGN guidelines. The review includes more subtle components such as positive feedback and reinforcement, such as praising a child for physical activity, even though they may not necessarily lose weight due to the effects on other health factors. While the guidelines also suggest increasing general physical activity to 60 minutes a day and reducing screen/sitting time, they recommend that children need to be given more opportunity and support in their activity in order to ensure they are confident in doing said activity. CSP proposed a brief treatment approach for care providers including physiotherapists as a primary method of changing behaviours in at risk individuals. The brief intervention guidelines recommend that physiotherapists identify inactive individuals and advise them to reach minimum amount of activity per week. As mentioned previously this includes approximately 60 minutes of moderate to vigorous activity, while 3 days per week should involve activities that strengthen muscle and bone. Activities that make up the 60 minutes a day include things that fit into their day easily. Examples of these include: walking or cycling to school, playing a sport through the school or at home, or popular activities such as WiiFit. The guidelines also recommend the physiotherapist “aim to improve people's belief in their ability to change (e.g verbal persuasion, modelling, or exercise behaviour).., and provide ongoing support, including written materials and goal setting.” The guidelines finally recommend an endorsement for pedometers, walking and cycling schemes to promote physical activity. The current literature surrounding obese adolescents and physiotherapy care involves reducing energy intake, increasing physical activity while decreasing “screen time”. The Australian guidelines also recommend frequent contact with patients and family, and weight management is recommended for most children rather than weight loss. Other research by Thury and de Matos (2015) indicated that school and family based interventions involving physical activity and dietary changes are the most likely interventions to be successful. Programs were also found to have more efficacy if they are longer in duration and focused on children in middle school or younger. A common theme between the 2 studies are that weight maintenance can be achieved via a behavioural change and the obese adolescent may be more motivated during adult years to adopt a healthier lifestyle and lose weight. Because obesity prevalence rates are increasing, the current guidelines attempt to slow the rate (i.e have people maintain their weight status), rather than gain or lose weight. The NICE Guidelines define human behaviour as, 'the product of individual or collective human actions, seen within and influenced by their structural, social and economic context' (p 9)  . One can then understand behaviour change to occur when factors influence the aforementioned contexts. Acting on the various dimensions of human behaviour may result in a positive change in those behaviours and consequently, has the ability to alter patterns of disease . To change behaviour, it is important to be aware of the determinants of behaviour change. The Social-Cognitive, Operant Learning, and Planned Behaviour theories have produced a list of determinants including: intention, perceived behaviour control, self-efficacy, outcome expectancy, response-reinforcement contingencies, and discriminative stimuli . Theories are effective at describing and explaining behaviour change, however, deciphering how to inspire change remains a challenge. Michie et al. demonstrate how techniques of behavioural change are mapped onto different determinants and recommends that therapists should carefully select interventions that are shown to be valid and reliable for impacting the intended determinants that is the focus of change. Globally, healthcare systems are adopting the International Classification of Functioning, Disability, and Health Framework (ICF). The ICF is a biopsychosocial model which allows for interprofessional collaboration, and a multidisciplinary and patient-centred approach. By addressing and promoting behaviour change, physiotherapists are adhering to the current standards of practice. No current models integrate behaviour change into clinical reasoning. However, to follow a biopsychosocial approach it is necessary to include it in clinical reasoning . 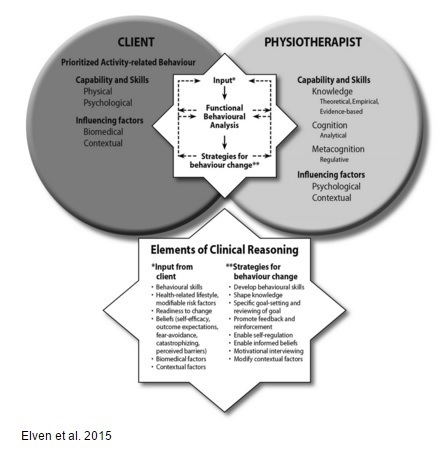 The conceptual clinical reasoning model illustrated by Elven and others shows the working relationship between the patient and the physiotherapist as well as the intervention attributes that promote behaviour change. The model highlights strategies for behaviour change that can be used by physiotherapists and offers an overarching structure to develop clinical reasoning. To inform practice of physiotherapists, public health research tends to focus on more measurable and quantifiable outcomes such as weight loss, number of hours of physical activity, or hours of sedentary behaviour. Even though behaviour change is attempting to address these factors, physiotherapist are in a position to address ethical issues. Overweight or obese adolescents are considered to be a vulnerable population and some of the ethical issues that may hinder behavioural change are concerning the adolescent's empowerment, dignity, autonomy, and wellbeing. Riiser et al. speculate when feedback and counselling is provided and interventions are individualised, adolescents are empowered to make ethical decisions about their health behaviours. The Centre Hospitalier Universitaire Vaudois, a WHO Collaborating Centre, hosted a meeting with an international group of health professionals to develop a structure for creating a trustful environment . In summary, the group established a list of characteristics of health care providers and settings necessary for fostering a trusting and cooperative partnership with adolescents. This list includes: an empathetic respectful climate, reassessment of the adolescent's understanding and reasoning, and the health care provider remembering that autonomous decision-making capacities can evolve over time and depends on the severity and complexity of the decision. The clinical reasoning model suggested by Elven et al. has ethical components embedded within such as the recommended strategies for change. Some of those strategies are enabling self-regulation, shaping knowledge, and enabling informed beliefs. Those strategies work to empower the adolescent and equip them with knowledge necessary to make informed autonomous decisions. By considering these two models in conjunction with each other, physiotherapists will be able to establish a trusting environment and increase the likelihood of fostering behaviour change by empowering adolescents. The TTM is a model of behaviour change first developed in 1977 by James O. Prochaska to aid smokers in ceasing their negative and addictive behaviours. It has since been used in numerous studies across 12 different problem behaviours such as weight control, high-fat diets and quitting cocaine. It has been used as a method to determine an individual’s readiness to change, progress through change and maintenance of new behaviours, and has been described as an integrative and comprehensive model which builds upon a broad range of psychotherapy theories. The TTM consists of six stages of change and ten processes of change, with self-efficacy and decisional balance being central themes of the model. The TTM recognises change as a process that evolves over time with the individual moving through the series of stages. The time an individual spends at each stage can be variable but the step needed to be taken to move from one stage to another are not (ProChange Behaviour systems 2015). It is described as a cyclic change process rather than linear as individuals may progress through stages and then relapse many times before maintaining meaningful change. The physiotherapist can use the TTM to determine the stage a patient is in and then use the processes of change to facilitate progress through stages and reduce the probability of relapse. As described earlier, obesity and weight gain is a modern day epidemic and is growing in both the adult and adolescent populations. Problem behaviours such as weight gain and sedentary lifestyles often start in adolescence and when repeated over time, become habitual and part of an individual’s self-image. By targeting an at risk adolescent population using TTM principles, physiotherapists may be able to invoke lifestyle changes that will be carried into adulthood. The TTM is a model which is being used in clinical practice throughout the world across a broad range of populations including adolescents. Kidd et al. described the TTM as an appropriate and valid tool for use with an adolescent population, with several studies employing the model for changing risky behaviours exhibited by adolescents. Decisional balance is a core concept of the TTM and describes the pros and cons of changing a behaviour. When progressing from one stage to another, especially in the earlier stages, the individual must believe that the pros of changing are at least equal to if not greater than the cons. Moving from pre-contemplation to action, the pros increase by one standard deviation and the cons decrease by half a standard deviation. In pre-contemplation, the cons outweigh the pros, are approximately equal in the contemplation stage, and the pros outweigh the cons in the Preparation and Action stage. Self-efficacy is another core concept of the TTM. Bandura  originally introduced the concept and defined it as the strength of an individual’s expectation. A more detailed definition being, “the individual’s belief in his or her capacity to execute behaviours necessary to produce specific performance attainments”. Self-efficacy has been found to be a very strong indicator of health behaviour performance in issues such as condom use and weight gain, with confidence being a stronger indicator of future behaviour than past experience. Research has shown that self-efficacy is low in the pre-contemplation and contemplation stages and is significantly higher in the action stage. Prochaska et al. found progressing from one stage of change to another builds confidence and therefore increases self-efficacy. In order to select the intervention that is most suitable for a patient and their family, it is first important to identify which stage of change they are in. There have been a number of tools developed to help the clinician decide which stage their patient is in, such as the Stages of Exercise Behaviour Change (SEBC) scale. Processes of change, decisional balance and self-efficacy can also be measured using tools developed in the 1990s. Table 4 below gives a quick go-to guide to help identify and determine strategies for behaviour change. Table 5 below describes ten common mistakes that are made when trying to facilitate behaviour change. Research completed in samples of adolescents have demonstrated adolescents' perceptions of their weight and of contributing behaviours can be skewed compared to anthropometric measures. One Turkish study by Hisar and Toruner  demonstrates adolescents who are underweight consider themselves to be healthy, more than twice as many adolescents who are not overweight, think they are overweight, and less than half that are obese consider themselves to be obese. The latter finding is reinforced by a more recent study completed by Lu et al.. Self-perception surveys from 1988 to 1994 were compared to surveys from 2007 to 2012. The comparison illustrated a declining tendency for both boys and girls to accurately self-perceive as overweight or obese adolescents. 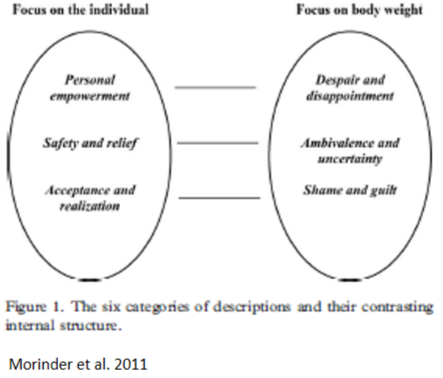 The implication of these studies is misperceptions need to be further explored with individuals for behaviour change to occur as they can arise due to a lack of understanding of contributing factors to being overweight or obese, lack of acceptance, embarrassment of being labelled, or inappropriate measures such as comparison with others. Obesity or weight bias describes the association of obesity with negative attributes such as laziness and ugliness and is rooted in the belief that weight is controllable by the individual alone . One of the challenges for adolescents in adopting behaviour change is the ideology of blame and the obesity bias adopted by teachers, health care professionals, families, friends, and classmates. These perceptions are in line with the medical model of health and does not consider the complexity of the psychosocial influences on obesity. Rukavina  administered questionnaires to adolescents in seventh and eighth grade and found adolescents believe individuals can control their weight through diet and exercise and a failure in will power results in fatness. This study found that adolescents possessing high controllability and valuing thinness is associated with lower levels of self-esteem. When working with adolescents, it is important for physiotherapists to distinguish between perceptions of controllability and self-blaming attitudes and personal control in obesity management. Furthermore, Wilson completed a study to capture the attitudes of adolescents towards obesity and found most adolescents display obesity bias and those that are overweight or obese tend to express indifference. Some comments expressed beliefs such as obese individuals were not cared for by their parents, they were geeky and unpopular. The majority of adolescents (69%) felt it was unhealthy to be overweight and it was up to the individual to lose weight; less than 10 percent of the sample had positive outlooks and approximately 33% expressed indifference. These studies collectively suggest adolescents do not have a thorough understanding of the complexity of obesity, reinforcing the need for intervention within this population. Wilson and Rukavina highlight that adolescents are susceptible to self blaming as the dominant belief is that weight management is the individual's responsibility.. With a need for clarification and intervention, there is a role for physiotherapists to educate adolescents and use psychological techniques to reduce barriers and to help with understanding obesity and the areas in which adolescents can take control and ownership over their obesity management. Morinder et al. conducted semi-structured interviews with a small sample of obese adolescents consisting of both male and females, and produced a model representing adolescent's perceptions and attitudes towards obesity interventions. By focusing on the individual instead of on their weight, adolescents come to a stage of acceptance and realisation where they feel like a change in behaviour is not being imposed on them, instead they are the drivers of the change. Adolescents involvement and compliance to treatment increases when they experience increased trust and confidence in staff who treat adolescents as unique individuals. When this approach is taken, adolescents describe a sense of empowerment, increased perception of control, a sense of competence, and a positive outlook for the future. In practice, adopting the model on the left would establish an environment aimed at fostering behaviour change by developing self-efficacy and encouraging internal motivators. Physiotherapists can play a key role in behaviour change by implementing certain frameworks and strategies that are effective in reducing adolescent obesity. The interventions chosen can be used in combination or in isolation to bring about change. If you revert back to the conceptual clinical model, several behaviour change techniques such as motivational interviewing, goal setting and cognitive behavioural therapy can be utilised provided there is adequate clinical reasoning for the approach taken. It is important that an adolescent intervention is patient-centred, holistic and provides self-management support as obesity management requires long term behaviour changes in order to be sustained. These interventions can be employed by physiotherapists to help understand the patient’s situation, their needs and aspirations and essentially help create positive changes in the adolescent’s life. Conventional management of adolescent obesity should focus on behavioural modification that takes into account the influence of the food choices and physical activity levels of the adolescent’s family. In order to support the adolescent through long-term maintenance of weight loss, parental confidence in supporting behaviour change is a crucial element of successful family based management efforts It’s vitally important for a physiotherapist to consider the role parental behaviour, motivation, and confidence play in successful treatment and prevention of obesity. A family management style framework (FMSF) can be utilised  in order to understand the family response to health related challenges and gain more of an understanding about how families can manage adolescent weight management within family life. This framework can be used to guide physiotherapists through the ability to recognise where family involvement can help to initiate and maintain weight loss and physical activity. The way families with an overweight or obese adolescent ‘define the situation’ and manage the condition influences their approach to prevention or management of obesity ; the ‘situation’ refers to the parent perceptions about their adolescent’s weight status and their physical activity levels. This framework can be applied to many of the changes necessary to bring about weight loss but as physiotherapists, one of our key roles is to establish the problems associated with increasing physical activity and reducing sedentary behaviour. In this framework, 'contextual influences' affecting the management of adolescent obesity include their social network, the health care practitioners and systems and their financial resources. It is important the adolescent is surrounded by a positive motivating environment, as interpersonal relationships, including family, peers and social networks can all influence health-related behavioural change in childhood which is essential for future weight management. These supportive social networks can have a beneficial effect on adolescent’s physical activity levels, reducing sedentary behaviour.Furthermore, parent’s whose adolescents are overweight or obese tend to underestimate the severity of the problem. In turn, this attitude minimises the size of the problem and downplays the need to change health behaviours, seek advice, or explore and adopt weight management strategies. The centre for disease control and prevention (CDC) suggests that parents should play a role in physical activity promotion; they should help adolescents meet their activity goal by serving as role models incorporating exercise that is entertaining and agreeable into family life and actively encourage behaviour change that reduces sedentary activities such as watching television, playing video games, internet use and mobile phone use . On initial assessment of an adolescent where a parent is present, the physiotherapist should gauge the parent’s degree of potential readiness to change. This can be classified using the transtheoretical model of change. It is imperative the parent(s) are willing to change in order for the adolescent to be adequately supported through a weight management programme . Motivational interviewing (MI) is a directive, person-centred, counselling approach for bringing about behaviour change by helping individuals discover and resolve the absence of readiness to change behaviours. MI skills can be used to help the adolescent assess the benefits and drawbacks to their decisions and make an encouraging choice to change behaviour. This approach enhances the adolescent’s adherence to a behavioural interventionand increases intrinsic motivation. The goal of MI is to create an atmosphere in which the individual rather than the physiotherapist becomes the main promoter and representative for change. Expressing empathy: The physiotherapist must do this through reflective listening. See the world from the individual’s perspective. Developing discrepancy: Where is the individual now? And where do they want to be? Avoiding argumentation: The adolescent is responsible for change therefore the physiotherapist’s role is supportive and non-judgmental. Rolling with resistance: It is vital not to fight adolescent resistance but ‘’roll with it’’. Invite the adolescent to problem solve, acknowledge and explore their arguments against changing. A randomised control trial (RCT) highlighted that MI appeared to be a promising approach as an addition to a standard weight loss programme to promote physical activity in the context of adolescent obesity. MI could be used as part of a physiotherapy treatment approach and it could be either incorporated into an initial assessment or carried out in a follow up session. A step by step approach can be taken similar to that used in the previous mentioned RCT. Stage 1: The physiotherapist should establish what the adolescent’s thoughts and attitudes are and promote his/her awareness of them. Building a confident relationship by addressing what is important in the adolescent’s life such as hobbies, social support and occupation. Once their interests have been considered, weight and physical activity related apprehensions, e.g. body image and sedentary behaviours, can be commenced. At this stage it is important to explore any worrying or negative beliefs about changing behaviour. Stage 2: Problem solving begins at this stage and once the adolescent has concluded that behaviour change is a necessity, alternatives to current behaviours are deliberated. The physiotherapist works alongside the adolescent to decide upon the type, duration and frequency of activity that could be performed. Depending on the patient’s goals and what they are willing to achieve, one or more alternative behaviours can be chosen. Stage 3: At this stage the physiotherapist and adolescent should set SMART (specific, measurable, achievable, realistic and timed) goals. Potential barriers to the weight loss plan and strategies to overcome these barriers can be discussed. Stage 4: The consequences of behaviour modification and adoption should be considered. Addressing any unforeseen barriers and any negative feelings toward new behaviours is finally discussed before commencement. What to consider in practice? The physiotherapist’s job is not to jump ahead to any other topic but merely to allow the adolescent to explore this conflict. Instead of presenting arguments for change to the adolescent, the physiotherapist elicits these from the adolescent. The physiotherapist focuses on the issue to begin with, elicits defensiveness from an angry adolescent in response and then repairs the damage using reflective listening. Physiotherapist: I understand that you have come to see me about the pain in your lower back, is that correct? Adolescent: Yes, and everyone keeps telling me it is because I’m overweight and they have found no evidence of any damage. I tell you, if all you want to do is talk about is my weight, I may as well go home. It’s just a waste of my time. In the dialogue that follows, the physiotherapist resists the temptation to argue back, and uses reflective listening to come alongside the adolescent and diffuse the tension. Physiotherapist: For you, there’s a much bigger picture. It’s not just your weight that’s bothering you. Adolescent: That’s right, because time and time again I get told that my weight is a problem, like it’s the only thing that matters. Physiotherapist: Other things also matter and you don’t want them to be side-lined in our meeting today. Adolescent: No that’s exactly right, I want to talk about other things as well. Physiotherapist: Tell me, taking your time, about these other things. Central to any physiotherapy treatment is the need to set goals for your patients to achieve, a technique used to enhance motivation and engagement. A goal has been described as “the object or aim of an action”. Setting goals can facilitate behaviour change by channeling the attention of the patient towards improving their health and persistence. Two researchers found that greater goal commitment, ability, and self-efficacy to perform the tasks related to the goal were the biggest factors which maximized goal setting. Shorter term goals were found to be more useful than long (see SMARTER goals below) to promote self-efficacy especially in adolescents with shorter attention spans. Goal achievement can be enhanced by incorporating feedback following the completion of their activity or treatment. A study from McEwan et al. where the effect of goal setting on changing physical activity behaviour was reviewed, found a medium positive effect. They found benefits when the goal included moderate intensity physical activity or when the patient was free to to be active at any intensity they wished. CBT is a psychological treatment which stems from the cognitive model of psychopathology. The treatment is based on the theory that the problem behaviour (obesity, over-eating) is characterised by dysfunctional thoughts and beliefs which influence an individual’s physiological, emotional and behavioural reactions. Many eating and weight disorders such as obesity are characterised by unhealthy daily habits involving distorted cognitions and problematic behaviour cycles. As previously mentioned, weight control issues often develop in childhood and adolescence and are carried into adulthood, but the research shows that these problematic behaviours are more successfully changed in adolescents compared to in adults. CBT is an appropriate treatment for adolescent obesity because it emphasizes changing habits and attitudes that maintain psychological disorders. The clinician gathers information from the patient and/or their family using a number of different measures. The information gathered allows the clinician to establish baseline measures for the patient and clinically reason the most appropriate treatment intervention. This phase makes up the cognitive portion of CBT. In this phase the clinician helps the patient to challenge their dysfunctional thoughts and beliefs and work alongside the patient to set appropriate goals. The patient is taught skills to deal with obstacles in their life using cognitive and behavioural strategies as well as problem solving approaches. Patients are guided to look back at the progress made and the positive changes it has made to their lives. They also further practice skills to help deal with problematic situations. The CBT process that the patient has undertook is reviewed and the therapist is given an opportunity to evaluate the patient’s application of CBT to their life. CBT has been rigorously studied in the treatment of obesity in the adult population and to a lesser extent in adolescents with several studies reporting clinically significant improvements in the patient’s weight. A CBT program developed by van den Akker et al. achieved a mean 18.7% loss of percent overweight at one year follow up (p < 0.0001). The 12 week program was delivered to 73 children and adolescents aged 8 to 15 with a 96% completion rate. The program focused on four elements: healthy diets and exercise, coping strategies, positive self-image and reducing body mass index (BMI) and was administered over 12 weeks with an intake session, 8 children-sessions and 2 parent-sessions. Positive results were also achieved in a study by Vignolo et al. in a multidisciplinary programme delivered in an outpatient setting. Results after 5 years included a mean reduction of BMI of 11.5%, with a reduction in waist circumference and improved family habits. Both of the above studies used a multidisciplinary approach with the physiotherapist being a key member of the team, however, the CBT aspect of each intervention programme was delivered by a trained psychologist. It is reasonable to suggest from the above two studies and many more carried out that CBT is an effective intervention in the treatment of adolescent obesity when carried out by a psychologist. The use of CBT as part of a physiotherapy intervention for obesity is becoming more and more popular and the next section briefly looks at how physiotherapists can incorporate CBT into their day to day practice. Many physiotherapists are pursuing psychological qualifications themselves as they recognise that treating the mind and body at the same time can lead to improved long term results. CBT can be used by physiotherapists in many areas such as MSK, chronic pain and obesity. Incorporating CBT into physiotherapy practice allows physios to provide a more holistic approach and enhance delivery of the bio-psychosocial model to their practice. Self-Management (SM) is a vital component to maintain weight loss and physical activity participation. SM supports are used to prepare and empower people so they can manage their health effectively. 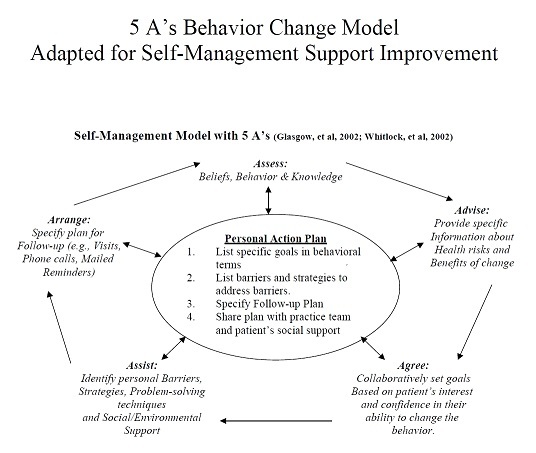 In order to support a SM plan the 5As Behaviour Change Model can be incorporated. This is a framework that will guide the physiotherapists in detection, assessment and management of diet and physical activity risk factors. This framework has been shown to improve patient outcomes in smoking cessation and has shown positive results when used in weight loss management . A recent study by Morais et al found that SM support structured according to the 5As, provided guidelines for a better SM approach in stroke patients. The 5As framework can be used in combination with other skills-based approaches such as MI to enhance adolescent interaction . Figure 7 below explains what questions and information are needed from the adolescent at each stage and essentially these help structure the action plan that will be undertaken in order to facilitate behavioral change self-management. As previously mentioned, it is important for physiotherapists to understand the boundaries of their scope of practice. As professionals, therefore, knowing when and to whom to refer an obese adolescent onto if necessary is essential. Other health professionals or services which may be required or beneficial to the patient include dieticians, psychologists and bariatric surgery in extreme cases. The obesity epidemic has been around for several decades and in spite of a surplus of knowledge and increased access to resources, statistics show obesity is still on the rise. Adolescents were chosen as the target population, as individuals are becoming overweight at a younger age and childhood obesity is linked to adult obesity. Healthcare professionals have turned to behavioural change to address other behaviours threatening health such as smoking. Physiotherapists are thought to be most effective in playing a role in addressing the physical components of obesity management. Identifying that these physical interventions are not producing the necessary outcomes of lowered incidence of obesity, physiotherapists have an emerging role in adopting and applying behaviour change techniques. By addressing behaviour change in obese adolescents, physiotherapists are contributing to health promotion and a proactive approach to reducing the incidence of adult obesity. This evidence-based CPD tool informs physiotherapy intervention for fostering behaviour change. Physiotherapists should aim to adhere to ethical principles embedded in the clinical reasoning and behaviour change model and to create a trusting environment for adolescents to feel empowered to make informed decisions regarding their health behaviours. This resource provides insight into the attitudes and perceptions surrounding adolescent obesity and details into application of models of change, interventions and techniques such as the trans-theoretical model, family interventions, cognitive behavioural therapy, and motivational interviewing. ↑ Seidell J, Halberstadt J. The Global Burden of Obesity and the Challenges of Prevention. Annals of Nutrition and Metabolism. 2015;66(2):7-12. ↑ Svensson V, Jacobsson J, Fredriksson R, Danielsson P, Sobko T, Schiöth H et al. Associations between severity of obesity in childhood and adolescence, obesity onset and parental BMI: a longitudinal cohort study. Int J Obes Relat Metab Disord. 2010;35(1):46-52. ↑ Must A, Strauss R. Risks and consequences of childhood and adolescent obesity. Int J Obes Relat Metab Disord. 1999;23:S2-S11. ↑ 8.0 8.1 Niemen P, Leblanc C, Canadian Paediatric Society, Healthy Active Living and Sports Medicine Committee. Psychosocial aspects of child and adolescent obesity. Paediatr Child Health. 2012;17(4):205-8. ↑ Whitaker R, Phillips S, Orzol S, Burdette H. The association between maltreatment and obesity among preschool children. Child Abuse Neglect. 2007;31(11-12):1187-1199. ↑ Cohen G. Helping Children and Families Deal With Divorce and Separation. PEDIATRICS. 2002;110(5):1019-1023. ↑ Ievers-Landis C, Storfer-Isser A, Rosen C, Johnson N, Redline S. Relationship of Sleep Parameters, Child Psychological Functioning, and Parenting Stress to Obesity Status Among Preadolescent Children. Journal of Developmental Behavioral Pediatrics. 2008;29(4):243-252. ↑ Washington R. Childhood obesity: Issues of weight bias. Prev Chronic Dis. 2011;8(5). ↑ Pine D, Goldstein R, Wolk S, Weissman M. The Association Between Childhood Depression and Adulthood Body Mass Index. PEDIATRICS. 2001;107(5):1049-1056. ↑ Vaidya V. Psychosocial aspects of obesity. Adv Psychosom Med. 2006;27:73-85. ↑ Nye, NS, Carnahan, DH, Jackson, JC, Covey, CJ, ZARZABAL, LA, Chaq, S.Y., Bockhorst, AD, Crawford, PF. Abdominal circumference is superior to body mass index in estimating musculoskeletal injury risk. Medical Science Sports Exercise. 2014;46(10):1951-1959. ↑ Scottish Intercollegiate Guidelines Network. 2010. #115 Management of Obesity. Edinburgh: Scottish Intercollegiate Guidelines Network. ↑ NATIONAL INSTITUTE FOR HEALTH AND CARE EXCELLENCE, 2006 [edited 2011]. Obesity Prevention. CG43. United Kingdom: National Intercollegiate Guidelines Network. ↑ 18.0 18.1 CHARTERED SOCIETY OF PHYSIOTHERAPY, 2012. Brief Interventions: Evidence briefing (physical activity, smoking cessation, obesity, alcohol and falls prevention). London: Chartered Society of Physiotherapy. ↑ 19.0 19.1 NATIONAL HEALTH AND MEDICAL RESEARCH COUNCIL, 2013.Clinical practice guidelines for the management of overweight and obesity in adults, adolescents and children in Australia. (N57). 1st Edition. Canberra: Commonwealth of Australia. ↑ THURY, C.& DE MATOS, C.V., 2015. Prevention of childhood obesity: a review of the current guidelines and supporting evidence. South Dakota State Medical Association. Special Edition: pp18-23. ↑ SCOTTISH INTERCOLLEGIATE GUIDELINES NETWORK, 2010. #115 Management of Obesity. Edinburgh: Scottish Intercollegiate Guidelines Network. ↑ 23.0 23.1 Michie, S, Johnston, M, Francis, J, Hardeman, W, and Eccles, M. From theory to intervention: mapping theoretically derived behavioural determinants to behaviour change techniques. Applied Psychology. 2008. 57(4): 660-680. ↑ World Health Organization. International Classification of Functioning, Disability and Health (ICF) framework to facilitate Interprofessional education and collaborative practice. Available from: http://www.who.int/hrh/news/2014/hrh_icf_framework/en/ [Accessed 10th November 2015]. ↑ 25.0 25.1 25.2 25.3 Elvén, M, Hochwalder, J, Dean, E, Soderlund, A. A clinical reasoning model focused on clients' behaviour change with reference to physiotherapists: its multiphase development and validation. Physiotherapy Theory and Practice. 2015. 31 (4): 231-243. ↑ 26.0 26.1 26.2 Riiser, K, Londal, K, Ommundsen, Y, Misvaer, N, Helseth,S. Targeting and tailoring an intervention for adolescents who are overweight: some ethical concerns. Nursing Ethics. 2015. 22 (2):237-247. ↑ Michaud, P, Wm Blum, R, Benaroyo, L, Zermatten, J, Baltag,V. Assessing Adolescent's capacity for autonomous decision-making in clinical care. Journal of Adolescent Health. 57: 361-366. ↑ 28.0 28.1 28.2 Prochaska JO, Velicer WF, Rossi JS, Goldstein MG, Marcus BH, Rakowski W, et al. Stages of change and decisional balance for 12 problem behaviors. Health psychology 1994;13(1):39. ↑ Prochaska JO, DiClemente CC, Norcross JC. In search of how people change: applications to addictive behaviors. Am Psychol 1992;47(9):1102. ↑ 30.0 30.1 30.2 30.3 30.4 Kidd P, Reed D, Weaver L, Westneat S, Rayens MK. The transtheoretical model of change in adolescents: implications for injury prevention. J Saf Res 2003;34(3):281-288. ↑ 31.0 31.1 31.2 Peterson JJM. Using the Transtheoretical Model in Primary Care Weight management: Tipping the Decisional Balance Scale for Exercise. 2009. ↑ 32.0 32.1 32.2 Prochaska JO, Norcross JC. Stages of change. Psychotherapy: Theory, Research, Practice, Training 2001;38(4):443. ↑ 33.0 33.1 33.2 Pro-Change Behaviour Systems. The Transtheoretical Model. Available from: http://www.prochange.com/transtheoretical-model-of-behavior-change [Accessed 12th November 2015]. ↑ Noar SM, Benac CN, Harris MS. Does tailoring matter? Meta-analytic review of tailored print health behavior change interventions. Psychol Bull 2007;133(4):673. ↑ Prapavessis H, Maddison R, Brading F. Understanding exercise behavior among New Zealand adolescents: A test of the Transtheoretical Model. Journal of Adolescent Health 2004;35(4):346. e17-346. e27. ↑ 36.0 36.1 Woods C, Mutrie N, Scott M. Physical activity intervention: a transtheoretical model-based intervention designed to help sedentary young adults become active. Health Educ Res 2002 Aug;17(4):451-460. ↑ Virginia Tech. The stages of change. Available from: http://www.cpe.vt.edu/gttc/presentations/8eStagesofChange.pdf [Accessed 12th November 2015]. ↑ Prochaska JO, DiClemente CC. Toward a comprehensive model of change. : Springer; 1986. ↑ Janis IL, Mann L. Decision making: A psychological analysis of conflict, choice, and commitment. : Free Press; 1977. ↑ Hall KL, Rossi JS. Meta-analytic examination of the strong and weak principles across 48 health behaviors. Prev Med 2008;46(3):266-274. ↑ 42.0 42.1 Health behavior models. International Electronic Journal of Health Education: Citeseer; 2000. ↑ Bandura A. Self-efficacy: toward a unifying theory of behavioral change. Psychol Rev 1977;84(2):191. ↑ Bandura A. Self-efficacy: The exercise of control. New York 1997. ↑ Galavotti C, Cabral RJ, Lansky A, Grimley DM, Riley GE, Prochaska JO. Validation of measures of condom and other contraceptive use among women at high risk for HIV infection and unitended pregnancy. Health Psychology 1995;14(6):570. ↑ Lechner L, Devries H. Starting participation in an employee fitness program: attitudes, social influence, and self-efficacy. Prev Med 1995;24(6):627-633. ↑ Prochaska JO, Norcross JC, DiClemente CC. Changing for good. : Avon Books New York; 1995. ↑ 48.0 48.1 Marcus BH, Rossi JS, Selby VC, Niaura RS, Abrams DB. The stages and processes of exercise adoption and maintenance in a worksite sample. Health Psychology 1992;11(6):386. ↑ Marcus BH, Eaton CA, Rossi JS, Harlow LL. Self‐Efficacy, Decision‐Making, and Stages of Change: An Integrative Model of Physical Exercise1. J Appl Soc Psychol 1994;24(6):489-508. ↑ MeadJohnson. Guide for identifying and determining strategy for stages of change. Available from: https://www.meadjohnson.com/pediatrics/us-en/sites/hcp-usa/files/%233%20in2A%20Stages%20of%20Change_0.pdf [Accessed 12th November 2015]. ↑ Stanford Persuasive Tech Lab. Top 10 mistakes in behaviour change. Available from: http://www.slideshare.net/captology/stanford-6401325 [Accessed 12th November 2015]. ↑ Papas MA, Alberg AJ, Ewing R, Helzlsouer KJ, Gary TL, Klassen AC. The built environment and obesity. Epidemiol Rev 2007;29:129-143. ↑ Strauss RS, Knight J. Influence of the home environment on the development of obesity in children. Pediatrics 1999;103(6):e85-e85. ↑ Golan M, Fainaru M, Weizman A. Role of behaviour modification in the treatment of childhood obesity with the parents as the exclusive agents of change. Int J Obes 1998;22:1217-1224. ↑ Doak C, Visscher T, Renders C, Seidell J. The prevention of overweight and obesity in children and adolescents: a review of interventions and programmes. Obesity reviews 2006;7(1):111-136. ↑ Woods C, Mutrie N, Scott M. Physical activity intervention: a transtheoretical model-based intervention designed to help sedentary young adults become active. Health Educ Res 2002 Aug;17(4):451-460. ↑ Hisar, F, Toruner, E. Adolescents' perceptions about their weight and practices to lose weight. Australian Journal of Advanced Nursing. 2013. 31(2): 23-30. ↑ Lu, H, Tarasenko, YN, Asgari-Madj, F, Cottrell-Daniels, Cherell, and Zhang, J. More overweight adolescents think they are just fine: a general shift in body weight perceptions among adolescents in the US. American Journal of Preventative Medicine. 2015. 49 (5): 670-677. ↑ Martin, SB, Rhea, DJ, Greenleaf, CA, Judd, DE, and Chambliss, H. Weight control beliefs, body shape attitudes, and physical activity among adolescents. Journal of School Health. 2011. 81 (5): 244-251. ↑ 62.0 62.1 62.2 Rukavina, P. Adolescents' perceptions of controllability and its relationship to explicit obesity bias. Journal of School Health. 2011. 81 (1): 8-14. ↑ 63.0 63.1 Wilson, F. Adolescents' attitudes about obesity and what they want in obesity prevention programs. Journal of School Nursing. 2007. 23(4): 229-238. ↑ 64.0 64.1 Morinder, G, Biguet, G, Mattsson,CM, Larsson, E. Adolescents' perceptions of obesity treatment-an interview study. Disability and Rehabilitation. 2011. 33 (12): 999-1009. ↑ Batch JA, Baur LA. Management and prevention of obesity and its complications in children and adolescents. The Lancet 2015. ↑ 66.0 66.1 Arsenault LN, Xu K, Taveras EM, Hacker KA. Parents' obesity-related behavior and confidence to support behavioral change in their obese child: Data from the STAR study. Academic pediatrics 2014;14(5):456-462. ↑ Knafl KA, Deatrick JA, Havill NL. Continued development of the family management style framework. J Fam Nurs 2012 Feb;18(1):11-34. ↑ 68.0 68.1 68.2 Jang M, Whittemore R. The Family Management Style Framework for Families of Children with Obesity. Journal of Theory Construction &; Testing 2015;19(1). ↑ De Onis M., Blössner M., & Borghi E. 2010. Global prevalence and trends of overweight and obesity among preschool children. American Journal of Clinical Nutrition.2010; 92 (5):1257-1264. ↑ Centers for Disease Control and Prevention. Physical activity for everyone: recommendations.[online]. [viewed 2nd November 2015]. Available at: www.cdc.gov/nccdphp/dnpa/physical/recommendations/young.htm. ↑ Jacob JJ, Isaac R. Behavioral therapy for management of obesity. Indian J Endocrinol Metab 2012 Jan;16(1):28-32. ↑ Armstrong MJ, Mottershead TA, Ronksley PE, Sigal RJ, Campbell TS, Hemmelgarn BR. Motivational interviewing to improve weight loss in overweight and/or obese patients: a systematic review and meta-analysis of randomized controlled trials. Obes Rev 2011;12:709–23. ↑ Wilfley DE, Kass AE, Kolko RP. Counseling and behavior change in pediatric obesity. Pediatr Clin North Am 2011;58(6):1403-1424. ↑ 75.0 75.1 75.2 Gourlan M, Sarrazin P, Trouilloud D. Motivational interviewing as a way to promote physical activity in obese adolescents: A randomised-controlled trial using self-determination theory as an explanatory framework. Psychol Health 2013;28(11):1265-1286. ↑ Rollnick S And Miller WR. Motivational interviewing? In: HEATHER N. and STOCKWELL T. The essential handbook of treatment and prevention of alcohol problems. John Wiley & Sons 2004: 110-112. ↑ McBean, D, Van Wijck, F.Applied Neurosciences for the allied health professions [online]. 1st ed. Edinburgh: Churchill Livingstone.2015;[viewed 2 November 2015]. ↑ Locke, EA, Latham, G. Goal theory vs. control theory: Contrasting approaches to understanding work motivation. Motivation Emotion.1991;(15) 9-28. ↑ Abraham, C, Michie, S. A taxonomy of behaviour change techniques used in interventions. Health Psychology.2008.27(3):379-387. ↑ 81.0 81.1 McEwan, D, Harden, SM, Zumbo, BD, Sylvester, BD, Kauliis, M, Ruissen, GR, Dowd, AJ, Beauchamp, MR. The effectiveness of multi-component goal setting interventions for changing physical activity behaviour: A systematic review and meta-analysis. Health Psychology Review.2015. Nov (13):1-22. ↑ Cooper Z, Fairburn CG, Hawker DM. Cognitive-behavioral treatment of obesity: A clinician's guide. : Guilford Press; 2004. ↑ Duffy G, Spence SH. The effectiveness of cognitive self-management as an adjunct to a behavioural intervention for childhood obesity: a research note. J Child Psychol Psychiatry 1993;34(6):1043-1050. ↑ Donaghy M, Nicol M, Davidson KM. Cognitive-behavioural interventions in physiotherapy and occupational therapy. : Elsevier Health Sciences; 2008. ↑ 85.0 85.1 Wilfley DE, Kolko RP, Kass AE. Cognitive-behavioral therapy for weight management and eating disorders in children and adolescents. Child Adolesc Psychiatr Clin N Am 2011;20(2):271-285. ↑ Yager J, Andersen A, Devlin M, Egger H, Herzog D, Mitchell J, et al. Treatment of patients with eating disorders. American Psychiatric Association: Practice Guidelines for the Treatment of Psychiatric Disorders; Compendium 2002:697-766. ↑ 87.0 87.1 Vignolo M, Rossi F, Bardazza G, Pistorio A, Parodi A, Spigno S, et al. Five-year follow-up of a cognitive-behavioural lifestyle multidisciplinary programme for childhood obesity outpatient treatment. Eur J Clin Nutr 2008;62(9):1047-1057. ↑ 88.0 88.1 van den Akker, Erica LT, Puiman PJ, Groen M, Timman R, Jongejan MT, Trijsburg W. A cognitive behavioral therapy program for overweight children. J Pediatr 2007;151(3):280-283. ↑ Turk DC, Meichenbaum D. A cognitive-behavioural approach to pain management. Textbook of pain 1999;3:1431-1442. ↑ Tsiros MD, Sinn N, Brennan L, Coates AM, Walkley JW, Petkov J, et al. Cognitive behavioral therapy improves diet and body composition in overweight and obese adolescents. Am J Clin Nutr 2008 May;87(5):1134-1140. ↑ Braet C, Van Winckel M. Long-term follow-up of a cognitive behavioral treatment program for obese children. Behavior Therapy 2001;31(1):55-74. ↑ Lyall J. The power of three. Frontline magazine. October, vol. 13, no. 20. ↑ 93.0 93.1 Morais HCC, Gonzaga NC, Aquino PdS, Araujo TLd. Strategies for self-management support by patients with stroke: integrative review. Revista da Escola de Enfermagem da USP 2015; 49(1):136-143. ↑ Ockene IS, Hebert JR, Ockene JK, Merriam PA, Hurley TG, Saperia GM. Effect of training and a structured office practice on physician-delivered nutrition counseling: the Worcester-Area Trial for Counseling in Hyperlipidemia . Am J Prev Med. 1996; 12(4): 252-258. ↑ Lawn S, Schoo A. Supporting self-management of chronic health conditions: common approaches. Patient Educ Couns 2010;80(2):205-211.